Tantalizing gourmet treats to satisfy the most discriminating palate. Keeping your purse or handbag safe and clean. 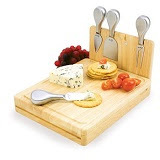 Our folding cutting board with tools makes a beautiful gift. 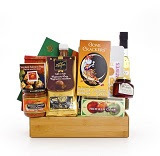 Ideal for the localvore – a thoughtful gift of fine BC-local edibles. This is a gift basket of tasteful temptations for a Pacific afternoon. If you received our last month’s newsletter, you may recall that I said we are all givers. There are lots of different types of Givers – some are showy, some are careful, some plan for months and months for that perfect gift, and some don’t give things, but rather give of themselves. This month, we’re focusing on the Ninja Giver.Ninja Givers are the ones who don’t necessarily give physical gifts. Their gift is their presence, and their unbridled willingness to go that extra mile. We all have a Ninja Giver in our workplace. Usually it’s that always-on, ready-to-go, eager-to-work, doesn’t-take-no-for-an-answer powerhouse – the executive assistant. You’ve all dealt with one, connected to some and I’ll bet some of them are your greatest friends. They know what it takes to run an office, impress clients, and give back to their coworkers. If you have one at your company, you know how blessed you are. They serve with honour and respect. Oftentimes, the Ninja gets everything done without anyone even noticing. You listen to them because you trust them.When I first joined the International Association of Administrative Professionals, what impressed me most was seeing how powerful these Ninjas become when they get together. They meet monthly to work on their office arsenal – sharpening their swords and learning how to serve you and your company better. The IAAP core values are Integrity, Transparency, Excellence & Collaboration, and the Ninjas excel within this framework of friendship and support. 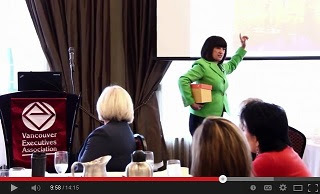 In honour of Administrative Professional’s Day (April 23rd), I want to recognize that it was at an IAAP dinner meeting that I first shared Abundance in a Box©. The support and curiosity from that roomful of Ninjas kept me motivated for nearly two years! I will be eternally grateful for their support and enthusiasm. We should all honour our Ninjas with our polished presence – strive to be as calm, organized, and amazing as them! Oh, and, of course, if you want to recognize your favourite Ninja Giver this Admin Day, call 604.689.5027 or email and we’ll create something even the Ninja would be proud to give. I also think the beginning of Spring is a great time to announce our upcoming Abundance in a Box© event – High Tea! We will be releasing details as they become available, so keep checking the Events Page for more information, or sign up for our mailing list for your personal invitation. Please feel free to invite all your givers, parents, siblings, friends, and anyone else who may need a little extra Abundance in their lives!